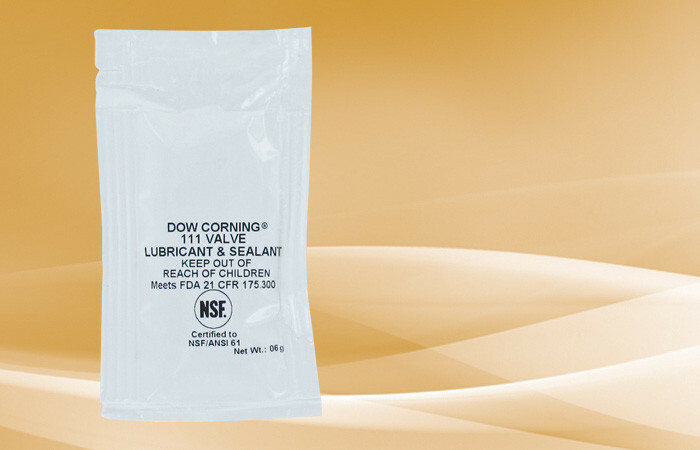 Dow 111 O-Ring silicone lubricant and sealant 6 gram pillow pack provides lubrication and protection for o-rings on housings. Dow 111 O-Ring Lubricant and Sealant 6 gram Pillow Pack | Dow O-Ring Lubricant for control and pressure plug valves, water softeners, and faucet valves. It can also be used as sealant for vacuum and pressure systems as well as on outdoor equipment that are subject to washing and harsh environments. This lube can be used for chemical barrier coating as well as anti-stick and sealant for transformer gaskets and equipment enclosures. This lubricant will prevent gaskets from sticking to metal and will help the o-ring to resist weathering. This silicone lubricant has excellent water resistance. It is also resistant to most chemicals as well.